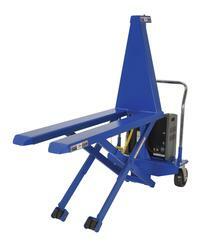 Ergonomic lift truck increases worker and machine efficiency and productivity. Reduces muscle fatigue and body injuries by bringing material closer to actual worker height. 12V DC power with on-board battery charger standard. Heavy loads can be lifted by electric hydraulic power and manually moved without use of fork truck. Foot brake may be set while loading and unloading for added safety. Push buttons to raise and lower lift are located on power unit. Optional hand control on coil cord available. Key-operated ON/OFF control for better security is built into the power unit. Unit rolls smoothly on phenolic 3" x 8" rear swivel casters and 3" x 2" front guide wheels.